Our service keeps your employees safe and comfortable on the job while maintaining their professional appearance. 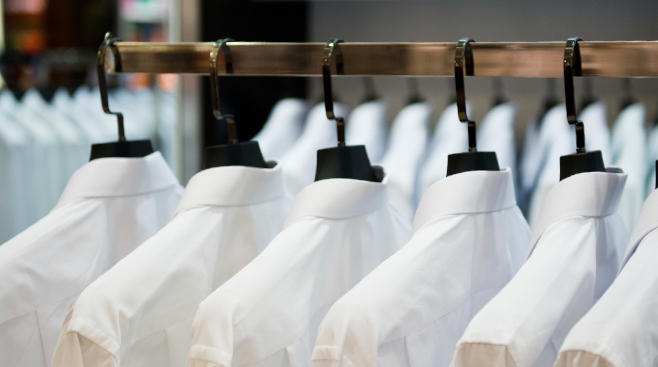 This is your one-stop shop for quality uniform supply. Suits with features such as a classic shawl lapel collar, full lining, large inside pocket for check pad, three button front, shoulder pads, chest & cuff buckram and fusible to retain that tailored shape and fit. Coats that are wrinkle- and stain-resistant. Traditional 2-button styling with notched lapels and a back center vent. To keep you organized, we added plenty of pockets. Outside you’ll find two lower flap pockets and another on the left chest. Inside there’s six more! Finished with metal buttons, a floating chest interlining for a smooth drape and an acetate lining. Shirts that feature two-button cuffs with placket, chest pocket and neatly hemmed tails. Double-needle seams and reinforced buttons for durability. Feel comfortable all day long in a versatile, button-down oxford that goes from corporate to casual with ease. Neckware are more than just part of a uniform, they are the perfect sartorial accessories for any wardrobe. Feel the weight, and look closely at the finish of our neckties and you will soon see that they are a cut above. Each of these beautiful neckties are half bottle shaped, and self tipped to add that luxurious look, feel, and drape. Scrubs and Labcoats that play a vital role in the patient experience at healthcare facilities. A well-defined uniform program will create a professional first impression, convey trust and credibility, and help make employees easily identifiable to hospital patients. Sign up to get coupons sent every other week to your inbox. It's that simple. Selective Cleaners is a known name in the San Fernando Valley for its three decades of exceptional service. Established by the Khoury family in 1972, it has always been managed by the family. We have several stores located in Mission Hills, Panorama City, Venice Beach, San Fernando and Downtown LA. For store addresses, phone numbers and hours click here.